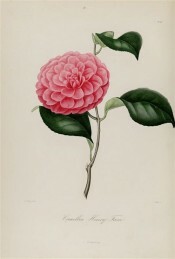 A cultivar of Camellia japonica L. The flowers of ‘Henri Favre’ are a full anemone form, to 10cm across, salmon rose tinged bright pink, with long, numerous, lightly veined petals, regularly imbricated. [ICR]. It was bred by M. Favre of Nantes, blooming for the first time in 1839. [ICR]. ‘A small but finely shaped red kind’. [GC 1853 and 1855]. Berlèse Iconographie vol.I pl.99/1841. Listed only in the 1857 catalogue [T.229/1857].